Very little change here as much of the south marsh and units are covered in ice and last weekend while it was snowing travel was difficult. However, the roads should be better this week, though with the warmer days expect snow packed roads to be a bit slick. The collection ditch has a fair amount of ice on it but there are still spots of open water for fishing. With the warmer weather chances are there is even more open water than a few days ago. Fishing continues to be good at the collection ditch for 12 to 16 inch trout with the occasional large trout being taken. Small spinners and minnow imitations were producing some fish for spin fishermen, but fly rodders were doing better. Blue winged Olives, ants, beetles, and Griffith’s gnats, are all good choices for dry flies. However, wet flies will probably outperform the dries right now. 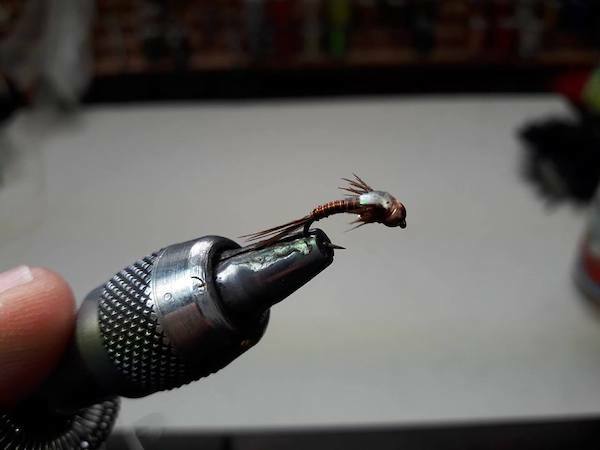 These include the usual small nymphs such as PT’s, hares ears, olive soft hackles, BWO emergers, red or blue copper Johns and prince nymphs. Wooly and crystal buggers in black, purple or olive are also working. Now would also be the time to start fishing egg patterns. In the crystal clear water of the collection ditch, if you can see the fish, they can see you. Go low, slow and wear drab clothing. Harrison Pass is closed so you need to go through Secret Pass to get there. South Fork Reservoir: Fishing is Still Slow to Fair. Jiggs Reservoir (Zunino Reservoir): Jiggs is Covered with Unsafe Ice.